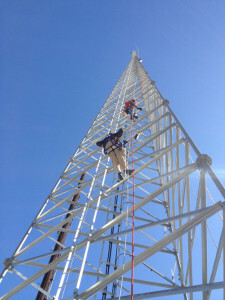 Seasoned professionals usually have tower climbing techniques or style to their climb. This climbing pattern will be innate, as much a part of the climber as breathing itself. Unfortunately, though, some people are in the habit of practicing bad habits while they are on the climb. Newbies can learn proper habits from the beginning. Even the “Old Timers” can practice putting safe habits into practice. Before the climb starts, a proper climbing plan must be in place. The plan is important because it is not just the climber who is involved in the process. This is when permits are obtained, the tower’s carriers are notified exactly when power needs to be lowered, LOTO procedures needs to be followed, and the specifications of the project must be gone over. Following a proper climbing plan ensures the safety of everyone involved. Every person, from the climber to the fork-lift operator needs to be familiar with all of the procedures in place. All employees need to know what to do and what to do in an emergency. It has been said before, but it bears repeating. Before you set out for the job site, check your RF meter. Check the batteries, check that it is reading and put it on! Radio frequencies are invisible. The only way you will know if there are RF signals around is if your meter is on, or if your suit starts smoking. This should be an easy choice to make. Tower climbing is a specialized skill. It is not something that someone just decides to do one day. Because of the danger involved in this job, OSHA standards are regularly updated. As soon as these new procedures take effect, every employee needs to be made current. New climbers will take classes in the basics. These courses serve as refreshers for experienced climbers who will usually obtain emergency certification as well. Out of laziness, forgetfulness, or lack of paying attention, a lot of safety gear gets used past its expiration. Harnesses, clips, and straps get used daily. Hopefully, you are checking them before each use. Even if they shown no signs of wear, unseen damage is likely after the expiration date. Safety gear can be the difference between life and death, chances should never be taken. Slightly more alarming than using expired gear is not using any gear at all. Every time you climb wear a helmet, gloves, safety glasses, boots, harness, lifeline, tool belt, rope grabs, lanyards, and carabiners. Even if it is 120° outside, wearing pants keeps your legs protected from the wind, cold, cuts, scrapes, and who knows what else. It tends to be colder the higher up you go. Bringing a jacket is always advisable, even in those hot summer months. Developing good habits early on will save headaches in the future. It only takes a few minutes to check off the list and it could save your life someday. When you first start out as a climber, it may be helpful to put a checklist in your locker to make sure you don’t forget anything. Even if you have spent your adult life on a tower, a “cheat-sheet” will remind you to use good habits and change bad ones.